Just when we thought we’d seen it all, the world gave us yet another extraordinary dose of perfection. And when it did, we had to do a double take, because there were two of them. It was like looking into one of those trick mirrors, a human kaleidoscope if you will, where time stood still, and all need for proper analysis got thrown out the window. Perhaps this is what true entertainment is all about – forgetting about what’s logical and simply appreciating the beauty of what’s in front of us. Tegan and Samantha Rybka, Australian wonder-twins from down under, are at the center of everyone’s focus in this story, and for good reason. The 23-year-old girls have managed to combine the art of show business, acrobatics, dance, circus-like abilities, and social media outreach all into one fantastical beautiful ball that no one wants to stop rolling. That said, we don’t think anyone could stop it even if they tried. When you look at their shining faces, you realize that they aren’t just making the things they do look easy – they’re actually easily doing them. Of course, that doesn’t mean their road to success wasn’t a sunny walk in the park. These marvelous twins have been honing and perfecting their craft since they were the mere age of three years old, and they haven’t stopped to take a breath since. Sometimes in life, it’s nice to try and dissect things to pieces, to try and figure out why they exist. And sometimes, it’s nice to just turn off our minds and appreciate it. 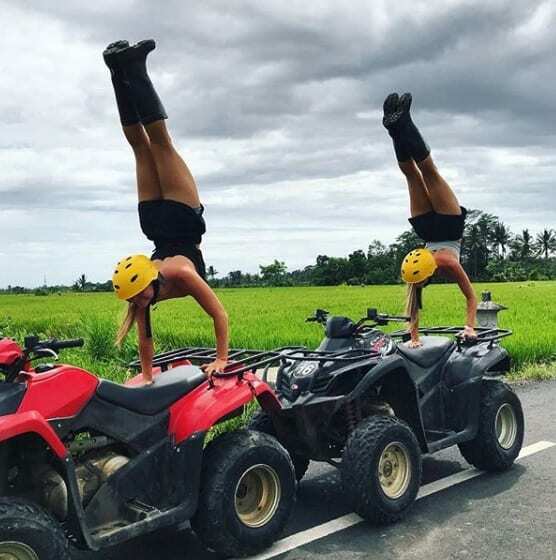 Meet Tegan and Samantha Rybka, the 23-year-old phenoms from Australia who are blowing away audiences from all over the world with their mind-blowing acrobatic abilities. They have taken social media by storm, and everyone wants to know more about these stunners from down under. If you are one of those people, you’re in luck today, because we’re about to tell you the inspiring tale of how these girls made it to where they are now. It all started when they were teeny little toddlers. They were at the mere age of three when their mother started incorporating within their minds a strict exercising regimen. And when we say exercise, we mean straight up acrobatics. Their mother was an acrobat herself, and she wanted her daughters to get their start early. The younger a child is, the easier their mind is to shape – so it would seem that the destiny of these twins was decided from the get go. Many years passed. Their twins’ mother never stopped training them, and their grasp for the complex art of acrobatics only grew stronger over time. In addition to getting better at the sport in the technical sense, their love for it grew more passionate as well. They started dancing at age six, and began to combine all of their various talents into one giant enchilada of entertainment. It was only a matter of time before these girls were discovered. When they were the age of 18, they appeared on Australia’s Got Talent in 2013. After years and years of training, years and years of people being amazed by their abilities, it was finally time to show what they could do to the entire world. They told the judges their entire life story on stage, but while everyone were impressed, it was nothing compared to how they felt once the girls started their act. In fact, the entire auditorium was in absolute shock. It’s not uncommon for people to have crazy reactions on shows such as America’s Got Talent (or Australia’s Got Talent), but Teagan and Samantha got such a strong reaction from the crowd that they not only advanced to the next round, but they eventually made it all the way to the semi-finals. Their success on the show was the beginning of them turning into the stars they are today – and soon, things would take an even greater turn. After people saw them on Australia’s Got Talent, their phone wouldn’t stop ringing. They were receiving offers to perform all over the world – and that’s exactly what they ended up doing. They started performing huge shows at corporate events, weddings, and any type of party you can imagine. In addition to their live shows, there was another stage that they began to grow quite familiar with – the stage of social media, and of course YouTube. As it stands right now, both Teagan and Samantha are on the cusp of reaching a total of 500 thousand followers on Instagram, with Teagan at 496 thousand, and Samantha at 486 thousand. But when you consider that these girls are the mere age of 23 years old, it’s pretty crazy to think that they’re being followed by folks of all ages – some probably even twice their age. Which brings us to another service that they’re providing for their fans – practical fitness advice. The world today is filled with such a large population of “influencers” on social media. They come in all shapes and forms, but the main idea is that they all provide some sort of service to their followers. It usually comes in the form of inspiration, rooted in a backstory where viewers can see the results in front of their eyes. If there are a couple of girls who have a crazy backstory, it’s Teagan and Samantha, having worked diligently on their craft since they were three years old. What people fail to realize is that capturing the interest of an audience is not an easy thing to do, no matter how talented you are. You have to have a certain level of stage presence, a natural charisma about you, and you need to truly believe in everything you’re doing. Teagan and Megan have been really creative in all the different kinds of videos they’ve posted, such as challenging themselves to do all sorts of crazy things with their bodies, to the shock and amazement of their viewers. This leads us to another element of what these twins have been up to lately. They have conquered the field of acrobatics, and shown the world that they are pretty savvy dancers as well. But recently they have decided that they want to their talents yet a step further. They made the choice to take their abilities into the truly advanced realm of acrobatics, where the field of contortionism lies. And friends, they have been absolutely killing it. In order to become fully fledged contortionists, it means that they’ve needed to push their bodies beyond the boundaries that they are generally used to. This is truly saying something when you consider what they’ve already accomplished, but there is a way they know they can get it done. The answer is the same one that has helped them up to this point in their lives. The same thing that helped them reach the semi-finals of AGT. Good old fashioned cold hard practice. These girls practice a ridiculous amount every day. In order to be the best of the best in any field, you need to work harder than anyone else, and you need to want it more than anyone else. This is why Teagan and Samantha practice their craft a total of six hours a day! Can you imagine practicing six hours a day at anything? Clearly these are girls who have a goal in mind, and nothing in the world is about to stop them. They have a few different locations where they like to work. When they want to work on their dancing and acrobatics, they meander over to their studio to sweat it out. But they also spend a great deal of time putting in hours at home, experimenting with new tricks, as well as perfecting old ones. The twins understand that while it’s important to discover new ground, it’s just as crucial to not forget about the foundations. As a result of all the time they’ve been putting in lately, they’ve managed to already do some pretty crazy things with their bodies that they couldn’t do before. Samantha said that “most of the time people are pretty freaked out” at what they are able to do… especially if they do something that’s really bendy. “Freaked out” may have a negative connotation, but we think she means that people are simply in awe of the marvelous sisters. These type of astonished reactions that people give can take place in all sorts of locations. Sometimes it will happen from a YouTube clip, but Samantha is mainly referring to the reactions she notices in person. They twins participate in a lot of public photo shoots, and also shoot a fair amount of stunts, so they’ve talked about how people always stop themselves on the street to watch them do their thing, taking a few pictures of their own as well. If there’s something that people love about these girls more than anything, it’s the fact that they are twins. Let’s be real, when you have something amazing, having it multiplied only doubles the impact of greatness. How is it that these two girls are so intertwined at the hip? We’re guessing that they have their share of differences, but up until now it’s been hard to figure out what they are. Just how close are these girls? Well, it turns out that these two girls actually shared the same room for their entire life until they were 21! Considering the fact that they made it to the semi-finals of Australia’s Got Talent, leading to numerous other jobs, we’re guessing they were able to afford separate rooms – meaning that the decision to sleep in the same room was by choice. Clearly these girls have a strong love for each other, and always want to be next to each other. Even though they currently have their own rooms, they still do all of the same activities. They said that they “have always done everything together,” going to the same school, taking the same dance classes, and even getting the same university degrees and the same jobs. What makes these two girls tick? There must be something that enables them to keep that engine running, when they require some sort of change of pace. The answer is a good, healthy dose of competition. The two girls aren’t just physically talented though – they also have their share of sage words of wisdom. Intent on looking after her own, Samantha has advised those aspiring acrobats out there to be very careful when they train. She wants them to go “slowly and gradually,” and to listen to their bodies and never give up. Samantha also maintains that every failure or mistake is in fact a learning curve, and an opportunity for further growth.